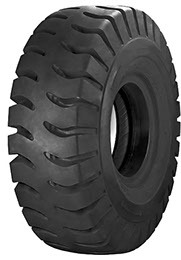 Ecomega, one of the leaders on the international tyre market for port industrial use, has created a unique set of CTR Stacker tyres. Thanks to many years of thorough research, Ecomega CTR Stacker tyres combine all the best and advanced features for maximum performance over time. Specifically engineered for material handling in different types of ports around the world, Ecomega CTR Stacker tyres guarantee highest performance and increased productivity. Ecomega CTR Stacker tyres guarantee longer tyre life thanks to the improved wear performance over time. Increased and massive tread blocks, along with superior design of the crown and protection of the sidewalls, ensure higher resistance to all sorts of accidental damage, cuts or ruptures. One of the best features of Ecomega CTR Stacker tyres is their maximum and exceptional stability during all sorts operations, even the most challenging ones. New treads are wider in order to offer improved manoeuvrability and precision for operators. Optimised design of tread blocks guarantee maximum comfort for the operator, thanks to the progressive placing of tread blocks on the ground and the reduction of vibrations and other noises. Long – lasting and highly efficient, Ecomega CTR Stacker tyres also ensure lower maintenance and repair costs over time. In order to meet the industry demands and standards, Ecomega tyres are specifically designed to carry heavy loads and to prevent risks of fatigue and failure. The distribution of heat is also even across the entire tyre, in order to guarantee longer tyre life. If you are looking for a set of highly efficient and reliable tyres for port industrial use, then you came to the right place. Ecomega CTR Stacker tyres guarantee exceptional performance, maximum safety and reliability over time, along with lower maintenance costs and maximum comfort for the operator, even while operating on the most difficult types of surfaces.